Sleeps 8 - Chapel Garth is an imposing property set on the upper part of the High Street at the foot of Staithes Bank adjacent to the Bethel Chapel. It was completely renovated in 2014 and this has created a fantastic holiday property set over 4 floors. The house is finished to a very high standard and offers many facilities for the holiday maker, but its two key advantages over other cottages in Staithes are on-site parking for up to two cars and a self contained patio to the rear with elevated views over Roxby Beck towards Cowbar. Chapel Garth is unusually spacious for a Staithes property and is perfect for holidays and short breaks throughout the year. Full central heating and pressurised hot water system. Open fire on ground floor and we provide a complimentary initial supply of logs and kindling October to April inclusive. Free Wi-Fi access. The patio gets afternoon/evening sunshine in the summer months and has a large table and chairs. Chapel Garth enjoys the perfect location in the heart of Staithes with easy access to local shops, pubs and restaurants and is only a short walk to the seafront. 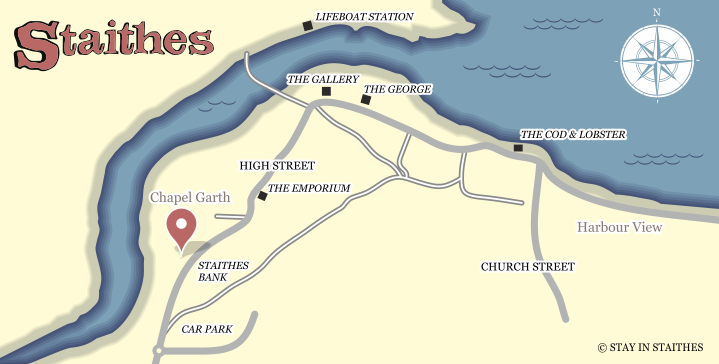 Parking for up to two cars on the driveway outside the cottage and we also provide one parking permit in the rental price if you need to park a car at Staithes Bank Top public car park which is 5 minutes’ walk from the cottage. Lower Ground Floor – cosy lounge with three large sofas, exposed original beams, original stone detailing and picture window to the rear overlooking the patio. Wide screen TV/DVD and surround sound speakers. Cloak/utility room with sink and toilet, washing machine and tumble dryer. Access to the rear patio. Ground Floor – front door opens in to a stunning open plan kitchen/dining/casual living area. Beautiful original beams, exposed stone wall and large sash windows to front and rear creating a wonderful light and airy room. Three comfy armchairs set around the open fire; flat screen TV, DVD and music player. Well equipped kitchen to rear with central island for cooking and seating at the breakfast bar. Electric oven, halogen hob, larder fridge and separate freezer, microwave and dishwasher. Dining area to the front has table seating up to 8. Elevated views from the kitchen area towards Roxby Beck and Cowbar beyond. First Floor – staircase up to first floor has amazing feature arch window on the half landing with Beckside/Cowbar views. Bedroom 1: superking sized bedroom with original stripped beams, exposed stone wall and feature fireplace (non working); dressing table and wardrobe. Bedroom 2: good sized twin bedroom with chest of drawers and exposed stone wall. Both bedrooms have large sash windows to give a sense of light and space. Large house bathroom with bath, large walk in shower, toilet and sink. Second Floor – staircase rises to spacious landing with full height vaulted ceiling and beautiful exposed stone wall. Bedroom 3: double bedroom with chest of drawers. Bedroom 4: twin bedroom. Both bedrooms have exposed beams and traditional “Yorkshire Light” sliding windows with roof top views towards the Stubble Path. There is a large wardrobe on the landing for guest use. Separate shower room with walk in shower, toilet and sink. Please note that there is some restricted head height on this level. .
Outside – gravelled garden to the front of the property and driveway for up to two cars. Large self-contained patio to the rear of the house with table and chairs that enjoys afternoon/evening sunshine in the summer months and has lovely views over Roxby Beck.